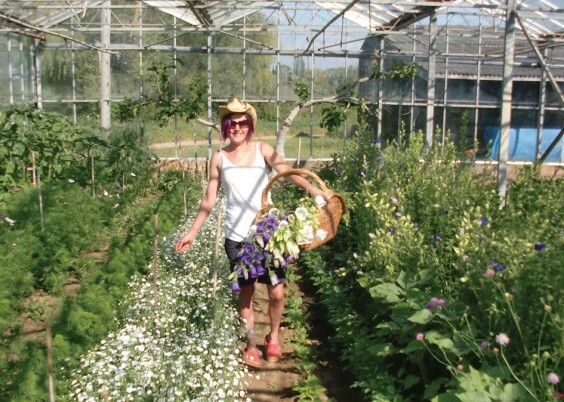 Hannah Genders visits a nursery supplying organic wedding flowers as well as veg. My son, Tom, gets married this summer and he and his fiancée want a traditional country wedding with natural country garden-style flowers. The whole event will take place in our local church, then the village hall and spilling out onto the green, so the venues are perfect for this theme. I managed to source some lovely cream vintage jugs, so all I needed were the cottage garden flowers to go in them. Thankfully, following up a recommendation, I found just the right person to supply them – very near to me in Pensham, a village outside Pershore. Jenn Haigh has been involved in growing organic vegetables for about five years and has a thriving business selling to local cafes and shops as well as offering a vegetable box scheme. All the produce is organically grown and of course local to the Worcestershire area. Jenn and her husband Russell run the business from their own market garden – they got married last September and she did all her own flowers for the wedding. This gave her the idea of diversifying into growing natural flowers for weddings, as well as continuing with the vegetables. Again, all the flowers are organically grown and are the wonderful old-fashioned cottage garden flowers we all love, like campanulas (or Canterbury bells to use the common name), larkspur, cosmos and sunflowers. She will also grow some wild flowers to add to the mix, so cornflowers to add that lovely deep blue and white Leucanthemum daisies. For greenery and texture Jenn grows perennial grasses and uses the seed heads, along with ivy and asparagus fern. She has also done some bouquets and table arrangements with herbs as they have a lovely leaf form and interesting flowers, and of course aromatic scents to add to the wedding venue! When I met up with Jenn I asked her how she had got into horticulture and she told me the story. Her childhood was spent largely outdoors on a smallholding but after school she found herself in a boring office job. Feeling very unfulfilled, she took a trip to New Zealand, and it was here she went “WWOOFing”. . . This stands for World Wide Opportunities on Organic Farms, and enables people to volunteer, in return for their board and keep, and learn all about organic growing. Jenn was hooked and realised growing organic produce was what she wanted to do – it had a resonance with her childhood and gave her the drive to set about finding the right location to set up her business. She and Russell found this in the form of an empty nursery complete with greenhouses and open land in the village she now lives in. The vegetable box scheme has gone from strength to strength – it is clear than Jenn is a perfectionist in all she does, as she now supplies some big names in the organic veg world in the Worcestershire area. The flowers are grown alongside the vegetables in the glasshouses and out in the open field. In some ways they are easier as the labour involved is picking rather than digging up, but the same problems apply with pests and diseases, which are all treated organically. The nursery should be buzzing with bees and butterflies this summer and I’m hoping to go back and have a look at the flowers before Tom’s wedding date in August. With her contagious enthusiasm for all things organic I think Jenn’s new direction in wedding flowers will do very well. See http://www.wwoof.org.net for info about volunteering on organic farms.